Pretty soon there will be tons of eggs to dye, and plenty of leftover egg cartons. 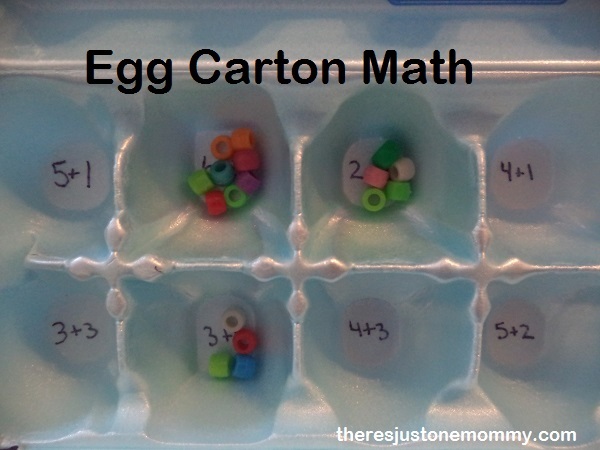 Put those egg cartons to good use with this easy to set up math activity! This math activity can easily be tweaked to fit the learning level of your student. For my preschooler I used a pen and wrote the numbers 1-12 in the spaces of the carton. To work on those pinching muscles and fine motor skills he used beads, placing the correct number in each space. 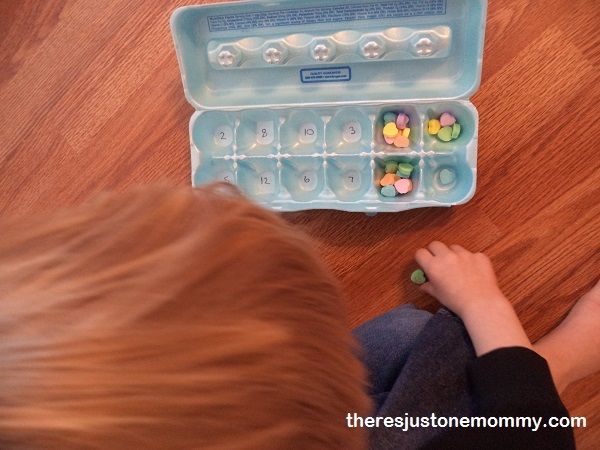 You could also use small pom-poms or even leftover candy pieces for this math activity. For the kindergartner I made one with simple addition problems. 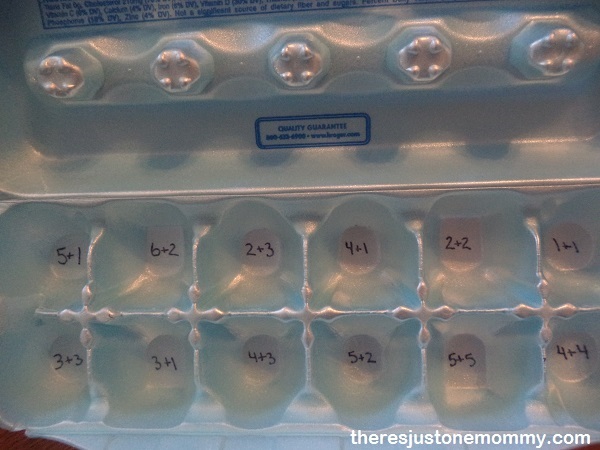 This simple math activity using those leftover egg cartons is sure to be a hit. 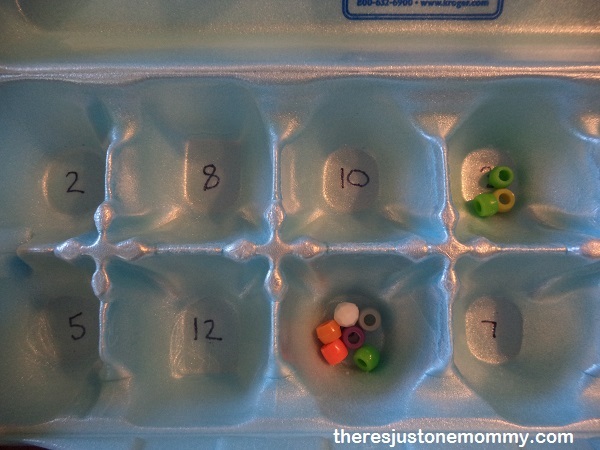 OMG, what a great idea, I so love this and going to try this…if I remember…darn mom brain. Ok I was so happy you did this post! I have to teach pre-k on the next up coming Fridays ( before now I was just a helper in the homeschool co-0p) because I have teens and its been so long ago I was clueless. I had come up with some stuff but needed more! I love this because this will go perfectly with my theme for my first week I teach solo! Yay you made my day. I better get busy saving some cartoons! Have fun, and let me know how it turns out! What a fun way to practice math problems!! I love this simple idea because you can add so much variation and even make it into a fun dice game. Love this idea, thanks for sharing on craft schooling sunday! Egg carton math can be so much fun. I am adding this post to my Easter Learning round up for Afterschool next week. Thanks so much for adding it to your Easter Round Up! Can’t wait to check it out! This is a great idea and I’m going to try it as soon as a carton becomes available!